A really quick study I did tonight trying emulate the style of the great Ralph McQuarrie. 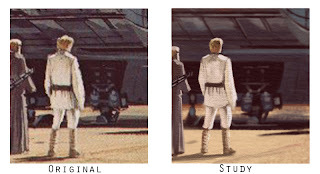 The point of doing something like this isn't to just copy exactly what you see but to take apart the original painting layer by layer and really consider what was going through the original artist's mind as they were painting and problem solving. This is one of the reasons I chose to only study a small section rather than copy the entire painting (which to me, just wouldn't seem right). Hopefully, I'll find some time to do more of these as this one has been a great learning experience and was a joy to paint.